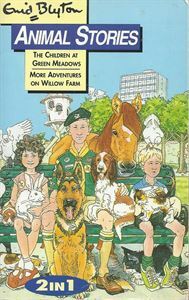 The three children at Green Meadows love animals but they haven't any of their own - until they are given a secret to look after. Then other problem pets begin to arrive, and soon Green Meadows turns into an animal house. In rescuing them all - cats, dogs, pigeons, a pony, a rabbit and even a guinea pig - Francis, Clare and Sam find adventures more exciting than they ever dreamed of! Willow Farm is a wonderful home for Rory, Benjy, Penny and Sheila. It's hard work at times - with cows to mik, horses to look after, eggs to collect and lambs and chickens to feed, but all the children agree they've never been happier.